�You�ll never walk alone� I was one of the lucky tossers to get a ticket to the last ever game at Wembley and watch England play Germany. We sang that song and I have never felt so much pride in my life. We (cough) lost (cough) but at least I can say that I was there. So we have football (soccer for you yanks!) games to relive our stress. 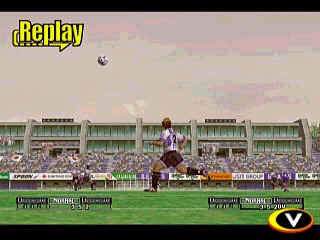 The FIFA series has set the bench mark for footballing games but for those who have played Virtua striker down their local arcade were certainly getting excited about this coming home to Dreamcast. Could it be the next FIFA game? Wait�what game! To be point blank, this game is unplayable. The controls are simple, but then you ask yourself, �where is the sprint button, where is the through ball, where is the �change player� button?� You see, all those years football games have been revolutionising themselves to be as realistic as possible. 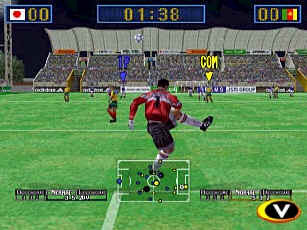 Virtua Striker looks at it all, laughs, and takes one huge step back! This is not football! Then it strikes you hard�you finally pull off a succession of passes together and actually play a through ball�but to your horror, your player actually runs away from the ball! Yet you never pressed anything! What in peter Buck is going on here? The AI is terrible. Players run away from the ball when you tell them not to. Your fingers start to bleed where you are pressing the D-pad so hard to make a player run in a certain direction. �Use the bloody control stick� you say. Well you can�t! Don�t ask me why, but you can�t use the control stick�Sega want to make life difficult for you! So there is the �shoot� button that you have to hold down to gain power, but has an awful delay. Then a slide tackle button which if it makes contact with the opposition, 9 times out of 10 your player will be sent off by a referee that is more strict than Hitler himself! Some games can see 3 of your team players sent off! After all that shock you are treated to perhaps the worst part of the game�as if it can get any worse. The sound! How do I put this��slish, swash, dud�. That is the sound of your player slide tackling, making contact with the player and him falling over! It�s absolutely awful. Then there is no commentary! So you might just about forgive this because it�s an arcade game�but it�s what we come to expect from our football games these days. All you get is an arcade style �gooooooooaaaaaaaaaallllllllllllll� when scoring. We have discussed the visuals of the game�but then we come to the next big problem. I sometimes forget to turn on the 60hz option. Oh well, never mind�only a border after all! Wrong! The game seems to stutter in the normal option so much that �Rain Man� talks more sense! I can not believe that a game with such amazing visuals stutters in the normal mode. All my other games work fine in the normal mode. I tried it round a friend�s house to see if it were my T.V. Unfortunately it wasn�t! As a reviewer I HAD to play this game. The more I did, the more I liked it. I found ways of beating the games little niggles. That is don�t play it like a football game but like an arcade game! Play Wimbledon style and just keep booting the ball up field until you get a result! Once you have gotten past the horror and learn how to play this game then you will find a very enjoyable game in there. But most people won�t bother and give up after the 5th game, who can blame them? To be perfectly honest the game is pretty awful. The sound is the worst I have heard in a long time. The AI is diabolical and the game is just unplayable. If you get past all that (unlikely) then you will find an enjoyable game in there. Somewhere! 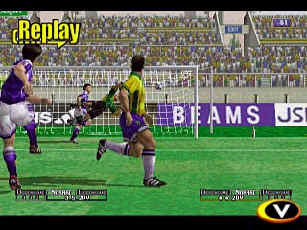 The strangest thing is that we have about 5 amazing beat �em� ups on Dreamcast and about 5 excellent driving sims�and yet all us Dreamcast owners are screaming out for is just 1 good football game. We have yet to see it and this is perhaps the worst of them on Dreamcast. People were hoping this game would be getting a mark of 8 or more, but it just leads to the biggest disappointment in football gaming history! 8 Amazing if your T.V supports 60 Hz! The visuals flow into your eyes with boldness and colour, and this may perhaps be the best looking football game on any system so far! Sound 4 One of those marks goes to the Dreamcast start up sound! The sound is awful, no commentary and slide tackles sound like jumbo jets flying over. Very poor crowd sounds too. Gameplay 5 If you can get past the disgraceful AI and the nasty referee then you might, might just find a game worth playing. Unlikely however. The options will keep you going and you will always come back for another game. Two-player mode is poor and the game is unplayable so if you do go back, you�re a saint!